As much as I love Etihad, I find that Abu Dhabi Airport leaves a lot to be desired. While the new first class lounge is great, the terminals as such are subpar. Terminal 1 is outdated, while Terminal 3 is way too small to handle the number of passengers they have during peak hours. Fortunately Abu Dhabi Airport is constructing a new midfield terminal, which will accommodate an additional 30 million passengers per year. That’s huge, especially when you consider that the airport currently has a capacity of about 23 million passengers. The new terminal will be 700,000+ square meters, and should mean that significantly fewer planes will have to leave from remote stands. Up until recently we’ve been hearing that the new terminal will open in 2017, so in theory it shouldn’t be far from finished. Unfortunately that’s not the case anymore, though. Gulf Business is reporting that the opening of Abu Dhabi Airport’s new midfield terminal is being delayed by two years, to 2019. That’s horrible, when you consider that we were supposed to be just months from the new terminal opening. Apparently they were originally having some problems with the terminal’s roof, though as far as I know that was factored in when the terminal’s expected opening was delayed from September 2017 to December 2017. So I’m not sure what the cause of the latest delay is, exactly. Fortunately Etihad has some decent lounges at Abu Dhabi Airport at this point. However, it was my understanding that they were going to up their game even further when they moved to the midfield terminal. I guess we’ll have to wait and see what the new lounges there look like, if/when the new terminal opens. Could this be a consequence of the merger talks between EY and EK? I would actually argue that they’re pretty good in general with sticking with schedule as compared to other parts of the world, including here in the U.S.
Plus, as an aviation geek, I LOVE boarding through remote stands– you get to see the aircraft up close and personal and get to better appreciate their size. @Ben, If I’m not wrong the Midfield terminal had already exceeded allocated budget and with the income from Oil draining out and the oil price being slump and showing no indication of an increase, I guess that was also a huge factor. Seriously, I just can’t deal with transferring there again. It feels like what Ellis Island must’ve been a hundred years ago, except everyone has mobile phones. Though I do like the “library” area between terminals. Given the major expansion projects in airports all around the GCC, do you think the competition may one day become too much and they would all lose? I mean new airports are being constructed in every major GCC city (Abu Dhawi, Dubai, Kuwait, Jeddah, Riyadh and Manama) and each of which is projected to accommodate at least 20-30 million passengers a year. How is that going to benefit the industry? I have a feeling they are self-destructing. Too bad. The transfer on EY F from DEL-AUH-LAX at AUH was the single worst transfer experience when not in coach. 110 minutes for the transfer, had to cut the security line twice (once by taking an elevator, then when all the lines funnel into one, duck under the cordon), and still had to rush every step and the door closed just behind us. I will not transit AUH again, will always try to overnight. I had to laugh out loud at the same line ‘Given the record the Middle East has when it comes to opening things on time, I suspect even 2019 is optimistic at this point.’ Right away I thought of the fiasco they call the new Berlin Airport. Seriously, if the Germans can’t keep to a schedule, good luck with the Gulf!!! I believe Etihad and Emirates will eventually have to merge. Two mega-GCC carriers that closely located, each operating as if the other doesn’t exist. 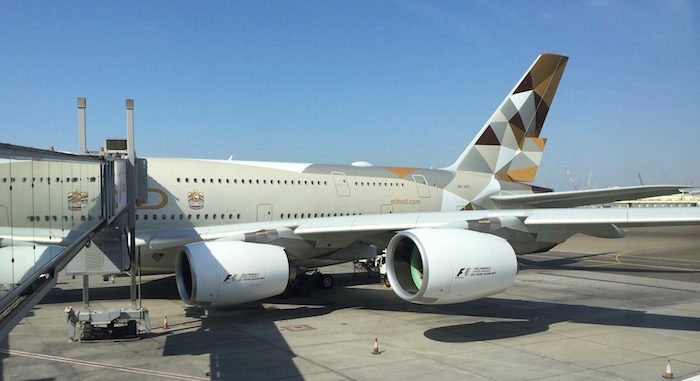 Etihad is already hurting financially. My bet is the survivors will be Emirates, after absorbing Etihad, and Qatar Airways with their excellent in-flight product. Long-term do not be surprised if Qatar surpasses Emirates, whose product is becoming a bit stale, compared to the always innovating Qatar Airways. Just my opinions of course. The construction failures in Abu Dhabi are immensely frustrating. I have been anxiously awaiting the openings of the Louve and Guggenheim museums on Saadiyat. I believe 2012 was the original opening year, now it’s anyone’s guess. I wouldn’t get too excited about the Midfield Terminal even if it does open. Word on the street is that it’s already not big enough for all flights, so the US preclearance facility will remain in Terminal 3, and all US-bound flights will continue to operate from that side of the airfield. That means lengthy bus rides across the airfield for anyone transferring to or from one of Etihad’s US flights – which will add more risk and hassle to what is already an unappealingly long process. Let’s not forget that Hamad airport in Doha was more than a year late opening, the new terminals in Jeddah and Muscat have basically been sitting there finished and unopened for the last six months, and Kuwait has just broken ground on a new terminal that was supposed to be finished in 2015. Of all the major hubs in the Gulf, only DXB has been relatively prompt about opening new concourses and terminals on schedule. @dave waller — stop bringing Lucky down with your reality. It’s almost making the Krug unenjoyable. Hamad Airport was nearly five years late by the time it finally opened! Abu Dhabi does not have a great track record for major projects. Examples include the Sheikh Zayed Mosque (10 year or more late), the main highway bridge to the airport (10 years or more late) and the Al Ain Airport (opened 10 years or more late). Looking at the aerial view above, it looks as though the Abu Dhabi midfield terminal is about the same size (by number of gates and space) as Hamad international? I’ve loved transitting through Hamad the last few years. Wow i thought the US sucked at infrastructure planning until i read about the Berlin Airport, heck even the new Penn station might be open before that.